Book your cabin and housing here! 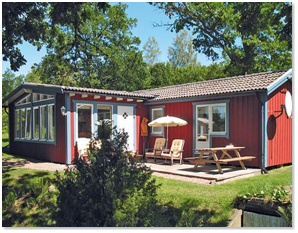 Here is a selection of cottages in the region of Sjuhärad. 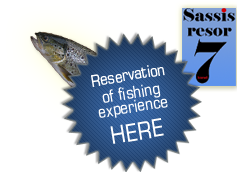 Click "Read more/Book" to send a booking request to Sassis Resor 7-Härad. 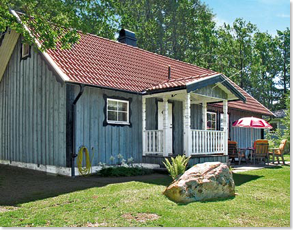 Sassis Resor 7-Härad is mediating the cottages on behalf of the owners. 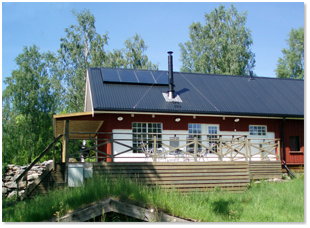 A charming cottage (66 m2) next to the river Jälmån with sauna. Close to fishing, canoeing and delightful forest walking. The plot is shared with the house owner. Badminton, croquet, bowler and bole available. No smoking! No house pets! Canoe and two bikes are included. Perfect for children! During June, July and August only weekly rent. Beautiful location with lake view in a charming and cultural environment. 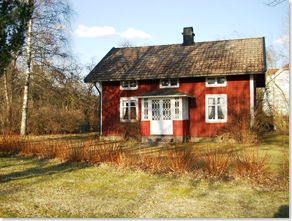 Cottage (43 m2) next to Lake Simmesjön near Länghem. Easy access to activities like trolley rides, Torpa Stenhus and Hofsnäs. No smoking! No house pets! Access to rowing boat - motor can be rented. 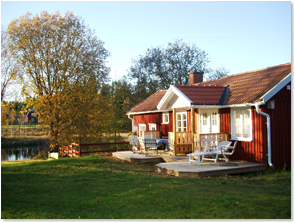 Close to the road between Hällingsjö and Hällesåker you can find this cottage (37 m2) in all its simplicity, only 5 m away from the lake Östra Ingsjön. Your very own sandy beach, jetty and rowing boat are a matter of course, far away from the stress in the big cities. No drinking water and sewage. No smoking! House pets allowed! lake Åsunden. Surrounded by a flourishing cultural countryside among the “Estates around the Lake”. Experience glorious sunsets on the lake or sitting on the terrace of the cottage. Access to fishing guide and fly fishing in the fishing pond nearby. Sauna on your own island! No smoking! (43 m2) is located in the middle of the village Nittorp in the municipality of Tranemo. Easy access to fishing, canoeing, hiking and the ice skating rink. 400 m to the bathing place. No smoking! House pets allowed! A cozy 19th century house (65 m2) in a beautiful environment. The interior is connected to the age of the house trough partly contemporary furniture. The house is for rent from May to October. No Smoking! No house pets! 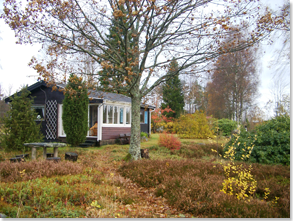 Well equipped cottage (70 m2) with lake view. Lovely grounds with old oak trees, lilac bushes and a large terrace. Here you can enjoy the lake views and amazing sunsets. 200 m to your own beach and boat jetty . No smoking! No pets! 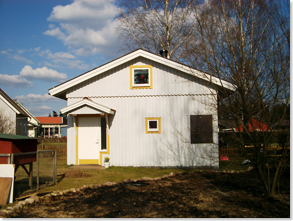 Newly build cottage from 2007 (85 m2) among meadows and forests. Very modern interior with a large sleeping loft and bedroom. 30 m from the River Jälmån. Including canoe and rowing boat. The cottage is disability friendly. No smoking! No house pets! 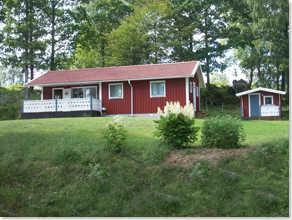 Reside 20 m from Lake Fegensjö with your very own bathing place and rowing boat. The cottage is 60 m2 with a associated shed of 10 m2.The cottage is fully equipped. Self-produced, ecological and organic juice and jam can be purchased from the owner. No smoking! No house pets! Modern entirely renovated cottage (120 m2) with 8 beds. 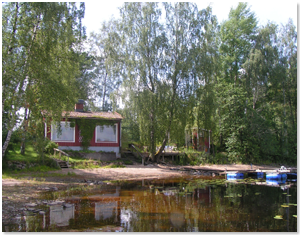 Private jetty, two small rowing boats and wood fired sauna in a quiet and peaceful area. The living room with its panoramic windows facing the lake and a ceiling height of 5.4 meters make this cottage into something special. No smoking! No pets! 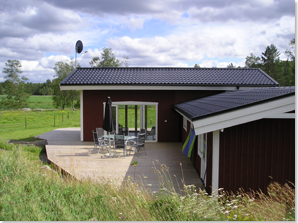 An old stable made room for this top-modern cottage (60 m2) with open design. Surrounded by valuable cultural history, exciting and living mill environment with the rapids murmurs outside the window. No smoking! No house pets! 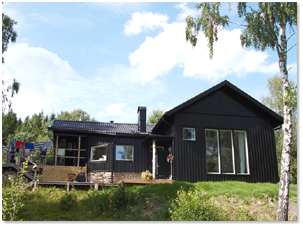 At the end of the road, directly by the lakeside of the lake Sämsjön you can find this lovely cottage (50 m2) in a secluded place. 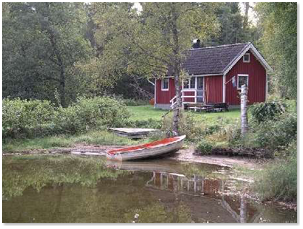 Perfect fishing and hunting cabin for up to 5 persons. The rustic furnishings with a wood-fired stove give you the right feeling. Rowing boat included. No smoking! No house pets! 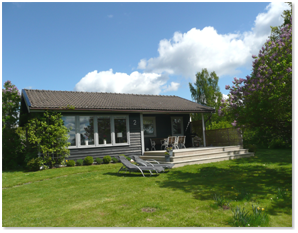 50 meters away from the lake you find your cottage Kleven 1 (70 m2). 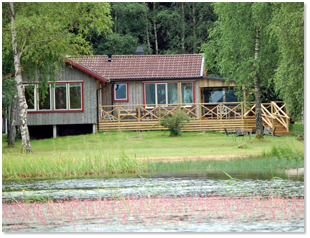 The cottage is perfect for up to 6 people and the starting point for fishing in the smaller lakes in the area. If you not want to fix your food yourself, there is the possibility of catering! Nice hiking and biking trails nearby. No smoking! Pets Allowed! Idyllic and recently renovated cottages (70m2) in the beautiful countryside located next to a pond. 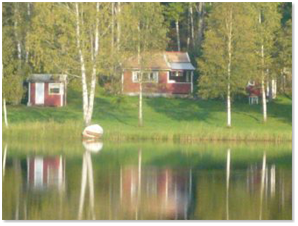 Proximity to the lake with excellent fishing opportunities and amazing natural experiences. Next to the pond, you have access to a wood-fired sauna. Nice hiking and biking trails in the area when. No smoking! Pets Allowed! 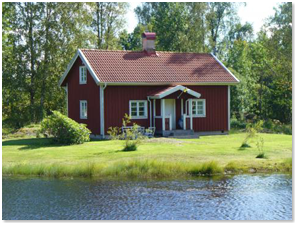 Nice cottage (92 m2) with lake view. Beautiful lot in quiet summer cottage area. Accommodation for up to 8 people. In the vicinity of the cottage Vitasjön 2. 300 m to lake beach and boat jetty . No smoking! No pets! Large loft cottage (110 m2) with lake view. Beautiful lot in quiet summer cottage area. Accommodation for up to 8 people. In the vicinity of the cottage Vitasjön 1. 300 m to lake beach and boat jetty . No smoking! No pets!